The John Inglis company in Toronto first opened in 1859 as a metalworking shop, and grew steadily over the decades under first John Inglis, and then later his sons. Inglis did substantial amounts of military work during World War One, but the Great Depression hit it hard, and both William and Alexander Inglis died in 1935 and 1936 respectively. The company went into receivership but was purchased by one Major James Hahn (DSO) and a group of business partners in November of 1936. Hahn and his associates saw an opportunity to use this large manufacturing facility to make machine guns for the military, and they were successful – in October 1938 they were awarded a contract to make 5000 MkI Bren guns.More contracts would follow, and by the height of World War Two the company had some 15,000 employees and more than a million square feet of floor space. Among many other projects, Inglis was contracted to make small arms for sale to the Nationalist Chinese government under Chiang Kai Shek – both High Power pistols and Bren guns in 8mm Mauser (to fit the Chinese standardization on that cartridge). A batch of 8mm ZB-30 light machine guns were brought in from the Far East to use as a pattern, and Inglis engineers were able to successfully redesign the Bren to use that cartridge and magazine. Where the story gets hazy is in trying to determine how many were made and for whom. The Chinese guns are marked in Mandarin on the receivers, and have “CH” prefix serial numbers, like the Chinese contract High Power pistols. However, two additional variations exist without those Chinese markings. Some are marked “7.92 Bren MkI” and “Inglis 1943” (or 44 or 45), and others – like this one – are just marked “7.92 Bren MkI”. The dated ones are typically referred to as Resistance guns, intended to be supplied to European resistance units for whom 7.92mm ammunition was more readily available than .303 – although information on how many guns were supplied in this way (if any) is difficult to find. The last group is generally called “sterile”, and it is not clear what their purpose is. This particular example is one of 23 that were registered in the US in the early 1960s to Interarms, and it does appear that they were associated with some clandestine US military activities. The serial numbers of those 23 Interarms guns range from 1-5343 to 2-8045, suggesting a production of 13,000 or perhaps as many as 28,000 guns – that is quite a lot to be undocumented and missing. Hopefully, more information will turn up in the future to shed light on the purpose and use of these 8mm Brens. 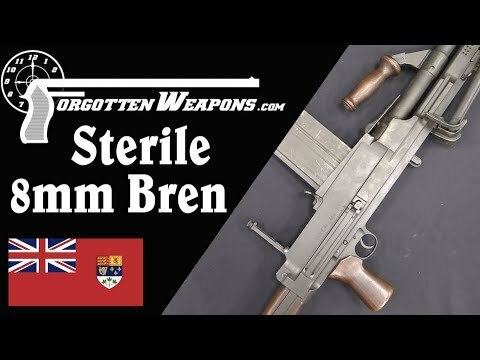 We do know for sure that many thousands did go to Chinese forces, and some were brought into the UK, where in the 1960s they were used in the development of the 7.62mm NATO L4 version of the Bren.